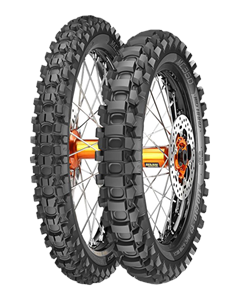 The ultimate off-road tyre developed with World Champion factory riders for the most extreme conditions. The ONLY tyre on the market that was actually developed and manufactured with a tread pattern that is REVERSIBLE. Yes, you can now have prolonged tyre life without scarifice thanks to the Metzeler MC360 Motocross & Extreme Enduro Tyre. The new highly agressive tread patern is designed to clear mud at very low speeds, eleimating the need to blast off to clear mud. Suited to both Motocross and Enduro riders the new MC360 offers the perfect solution for all applications offering a Mid-Hard & Mid-Soft compound. Pretty much a first in the world of the Extreme off-road tyre, the Metzeler MC360 is also road legal while still maintaining an agressive tread - The rear is also available in 19" making it a "Road Legal - Motocross Tyre". Knob distribution and geometry designed to offer outstanding gip and traction with high resistance both in dry and wet condition, form soft/loose terrains to hard.